This is it! I have finally come to the last party I threw last year. Well, technically this is the last two parties I threw last year. When you have two baby showers to throw in two different states within a few weeks, you have to take a few shortcuts. The first of these twin showers was for a church friend in October and the second for my sister-in-law over Thanksgiving in Washington. Thankfully, with small bits of personalization and different settings it hardly felt like a repeat. 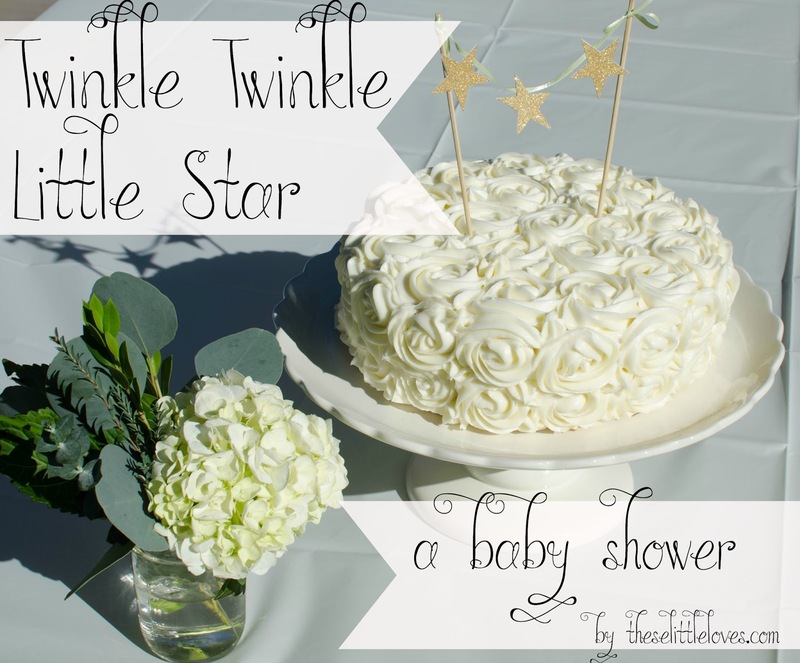 Once I decided on the lullaby 'Twinkle Twinkle Little Star' as inspiration for the shower, I knew that I wanted this party to look soft, almost dreamy. And there had to be stars, lots and lots of stars. 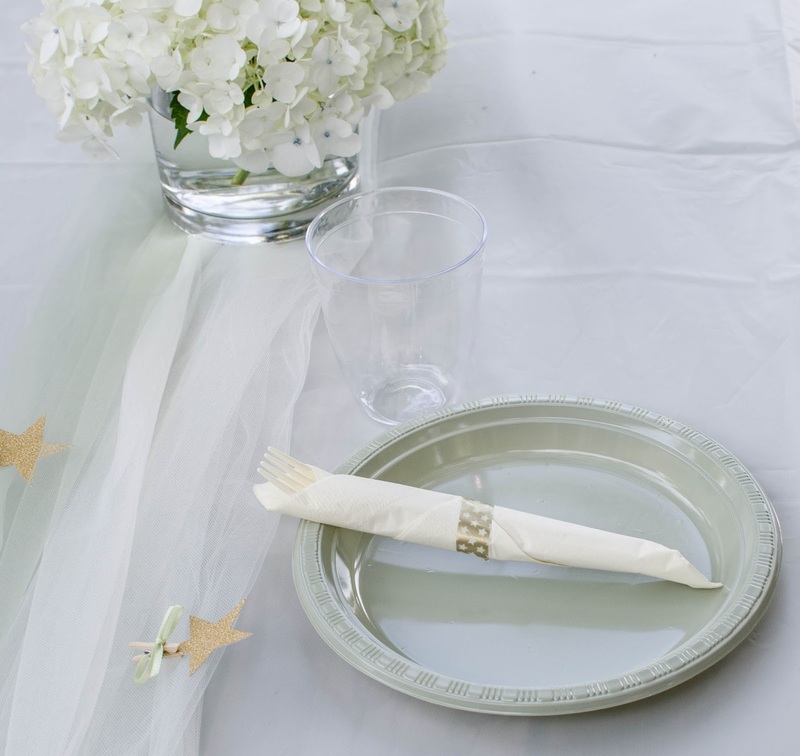 To keep the color scheme sophisticated, I chose gold for the stars, and accented with a soft sage green and ivory. I tried to set the tone of the party with the invitations. In the days of evites, I get a little giddy when I receive a beautiful invitation in the mail. Actually, I just get excited about snail mail in general. (Who wants to be pen pals?) Though DIY, these invitations are easier than they look. I started by calligraphing the phrase 'twinkle twinkle little star' and the guest of honor's name separately onto paper. Once dry, I scanned each one and imported them into a word file. I detailed the rest in text boxes, finalized the spacing, and printed the invitations four to a page on ivory card stock. (You can download the invitation here free for your personal use! Be sure to download the file and open, the preview often won't show the calligraphy.) For the finishing touches, I cut small stars out of glittery gold paper with my Silhouette Cameo and attached them to the top of each invite with double sided adhesive squares. And finally, I added a small strip of light green ribbon across the center, attaching it to the back with gold star washi tape (which you'll see more of later). 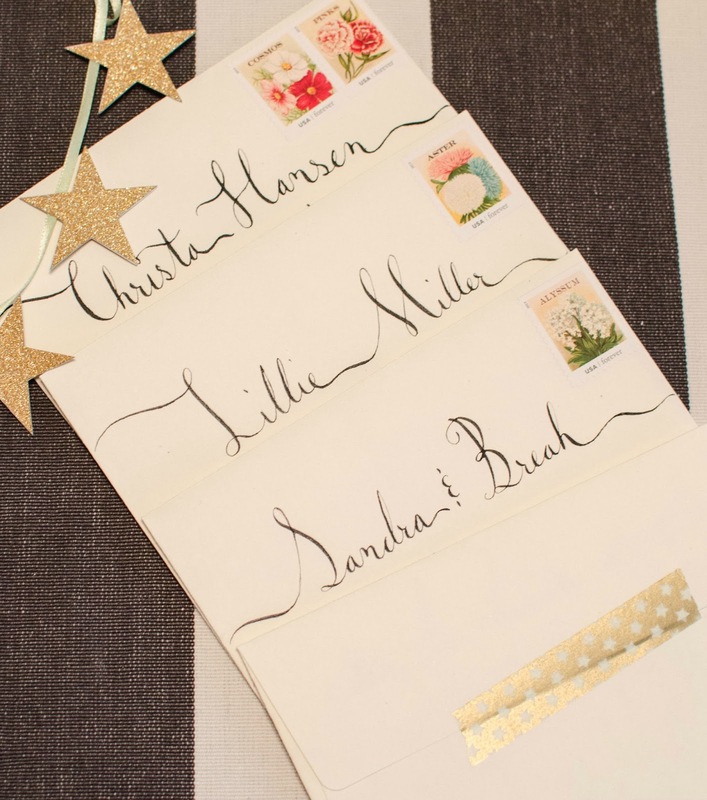 I carried the calligraphy style to the envelopes as an extra touch of pretty. Thankfully, the post office came through with pretty floral stamps that didn't ruin the vibe. Next came the decorations. 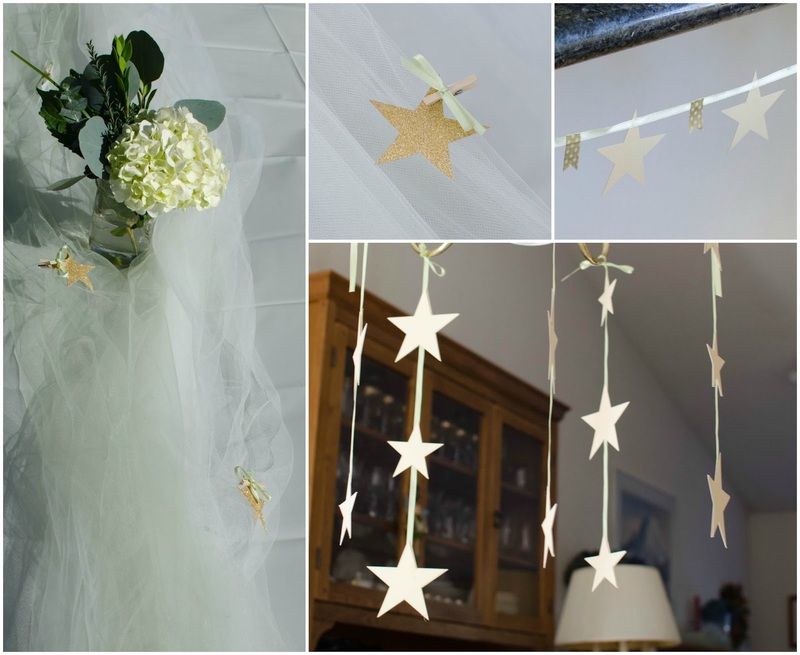 Stars, stars, a little ribbon, and more stars. 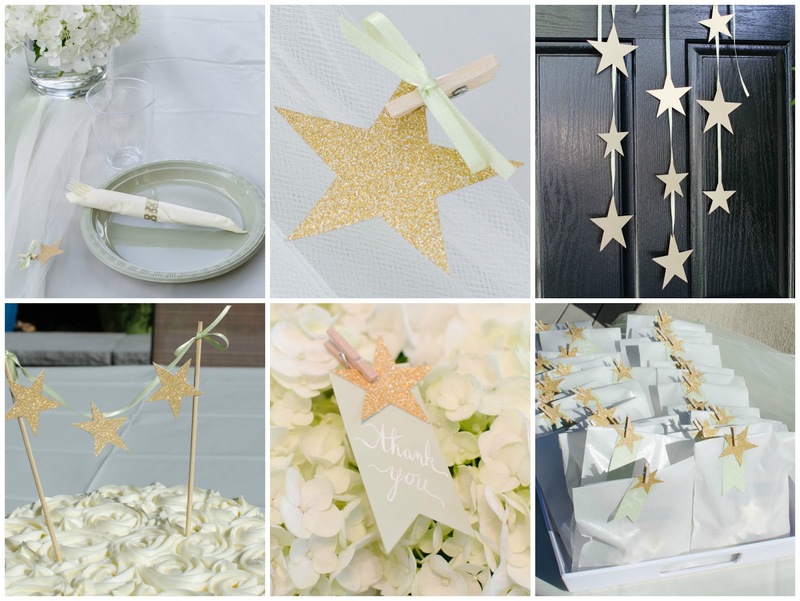 For the main party banner, a script 'Twinkle Twinkle Little Star' was cut from sage green paper and placed on ivory clouds while tiny gold stars dangled below. Instead of large centerpieces, small mason jar floral arrangements (my current favorite white hydrangea and greenery) were placed in the center of a decorative table runner. The table runners were perhaps the item I struggled with the most. I just could not picture any ideas that were within my limited budget. After an aimless trip to the fabric store, I purchased several yards of inexpensive ivory and sage green tulle and brought it home with no real plan. With a little trial and error, I decided to cut the tulle into long strips, bundle it loosely together on the tables, and tie the ends with the green ribbon. Fine, but missing something. 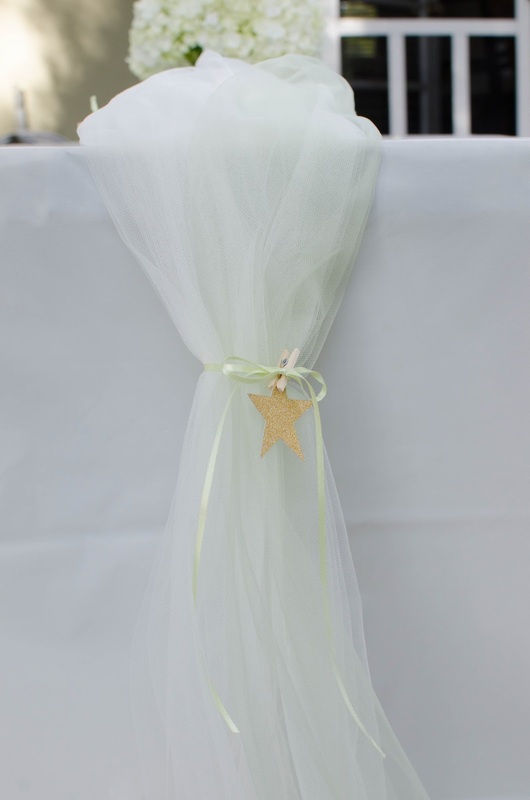 I didn't fall in love with the table runners until I started pinning glittery stars along the tulle with tiny clothespins and green bows. The stars took the runner from 'fine' to 'adorable'. Against the ivory table covers, they looked perfectly light and dreamy. With a subtle color palette and decorations, I didn't want anything too contrasting for the table settings. I found the perfect shade of sage green plastic plates to mix with the ivory utensils. 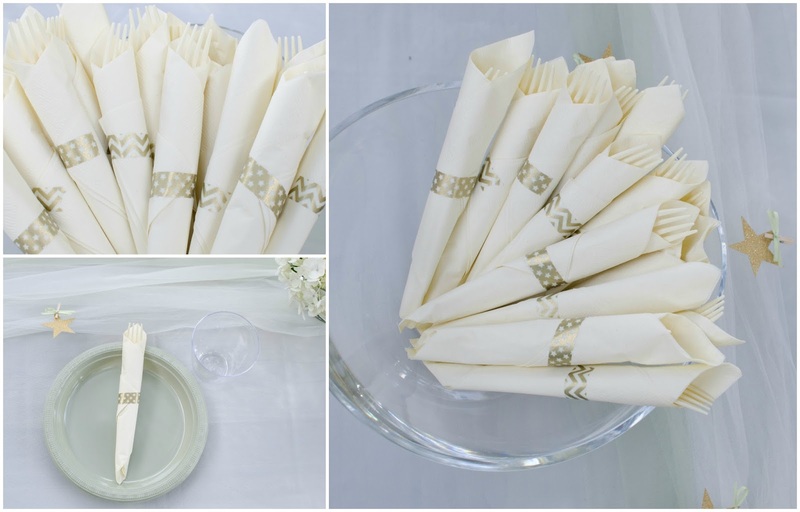 To add a little sparkle, I wrapped the ivory napkins and utensils with metallic gold washi tape in star and chevron patterns. So what did we put on those plates? The answer is lots of yummy things which I did not plan or make. Hooray for having co-hostesses for showers! If you have read any of my blog, however, you have likely realized it is almost impossible for me to throw a party without baking a little bit. Or a lot. Usually a lot. These showers were no different and I whipped up my favorite sugar cookies and tried out a fantastic new recipe for the cake. 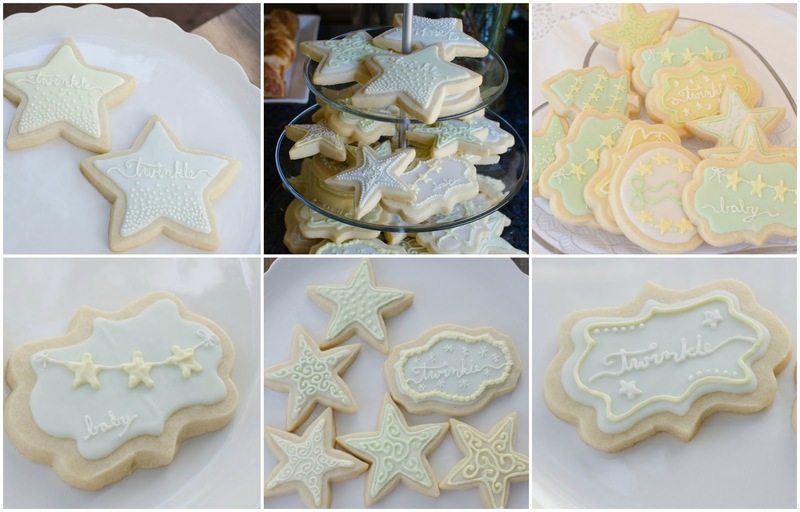 As with the party decorations, I embellished the cookies with an abundance of stars and tried to keep everything light and delicate with only three icing colors (white, light green, and yellow). As I mentioned, the cake was a bit of an experiment. Actually the entire thing was an experiment, which made me more than a little nervous. My first go-to cake recipe happens to be a Mexican Chocolate Cake that is wonderfully moist, but very very dark in color. 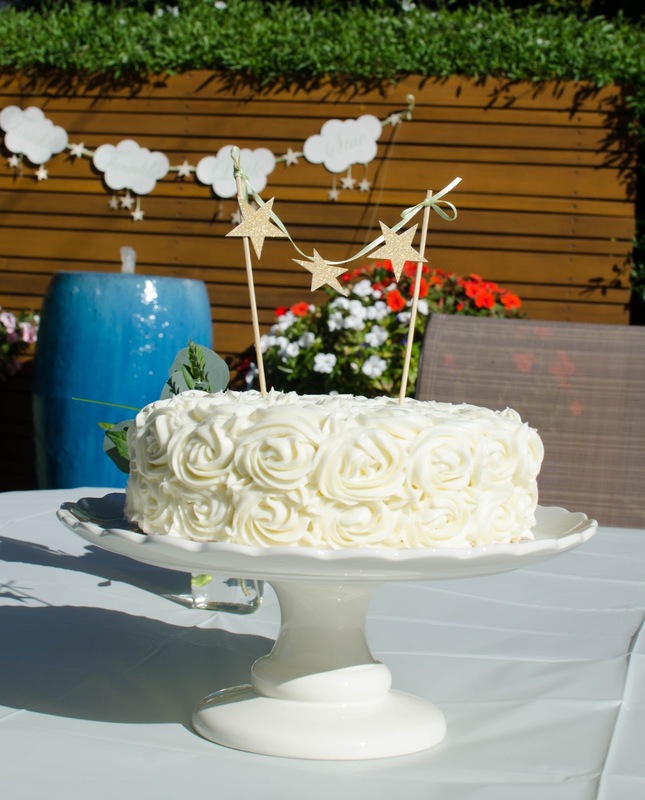 While still a favorite, I thought I should attempt a white cake to better complement this particular party. I decided upon a White Velvet Cake recipe, filled with Raspberry Preserves, and iced with Cream Cheese Frosting. It wouldn't be a problem that I had never tried the recipes, filled a cake with jam, or piped rosettes in cream cheese frosting before, right? With a big sigh of relief and a few online tutorials, it all came together almost too easily. Phew! After tasting the finished product and receiving several requests for the recipe, I think I have found the white complement to my go-to chocolate cake. Perhaps the most fortuitous detail in my cake experiment turned out to be the decorating style. Typically, I use fondant to decorate my cakes, but I was intrigued by a piped rosette cake on pinterest and decided to give it a try. The style reminded me of clouds and seemed all too perfect for the party. After icing the cake with a crumb coat, I started making simple rosettes with a large 1M Star Tip around the bottom of the cake. After the first ring was complete, I moved up a row and then worked into the center of the cake covering as much area as possible. Any leftover holes between rosettes were filled with small icing stars with the same tip. It was the easiest cake I have ever decorated. Ever. It took all of 10 minutes. There are a ton of tutorials online if you want to use this technique. Just be sure to refrigerate the cake so that the rosettes don't get droopy. The star topper was fashioned out of two bamboo skewers (cut to the right height), green ribbon, gold glittery stars and small bits of hot glue. For the second shower, I actually had to make two full cakes and I decided to use my gold wire 'baby' cake topper on the second cake. You can see it hiding on the right in the picture below. Both toppers are easily DIY-able and inexpensive. A few cupcakes, sparkling cider, and fruit infused water rounded out the dessert table offerings. 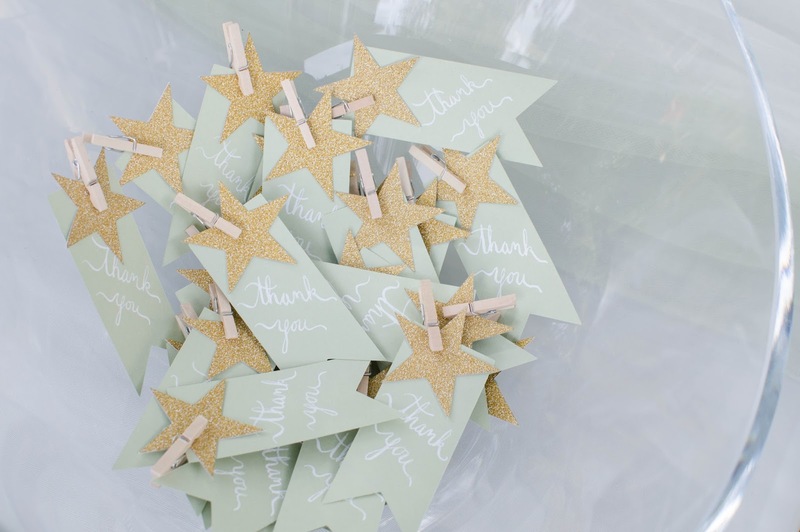 Not to be left out, the party favors also received their share of sparkly stars. Inspired by the favors from my Safari baby shower last year, I used the same glassine bags and added hand calligraphed thank you tags. 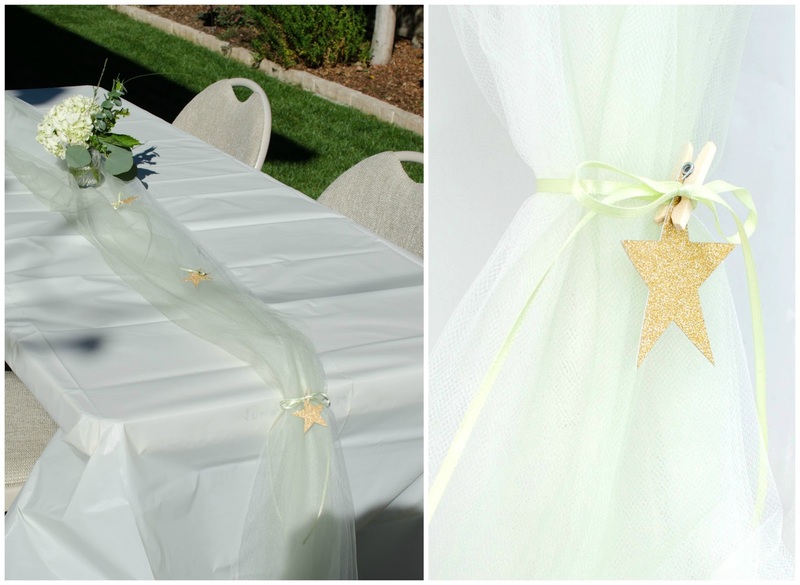 Glittery stars and tiny clothespins sealed the favor bags and tied in beautifully with the table runner details. Though the packaging was kept identical between the two showers, the party favors themselves were a point of divergence. For the first shower, I made homemade marshmallows and cut them into tiny stars with a miniature cookie cutter. Another first for me, but a fun experiment! Packaging them up with hot cocoa mix gave the guests a sweet treat to enjoy at home. 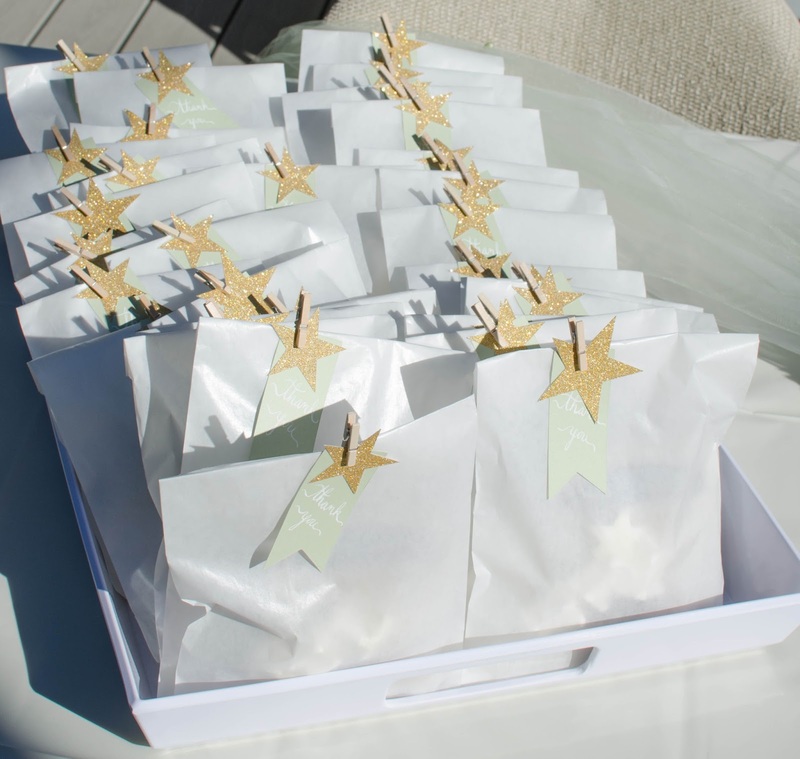 For the second shower, guests received two favors. I filled the glassine bags with a classic Texas favorite of mine, cinnamon sugar pecans. This treat holds a special place in my heart as I started making it during college back home, not to mention that the recipe quite possibly won the heart of my father-in-law when I started dating my husband years ago. Apparently, cinnamon is a slight obsession in their family. As a second favor, my mother-in-law had the adorable idea to gift star cookie cutters. She even tied them on ribbon and hung them on a small Christmas tree. Adorable and especially appropriate for a baby shower during the holidays. You may have noticed that I have yet to mention anything about shower games here. That is because we didn't do any! I've been on a mission lately to replace often-awkward party games with a group project or activity. I originally experimented with this at my Baby, It's Cold Outside shower where we decorated sugar cookies. For these showers I decided to have the guests create a nursery mobile to gift to the mom-to-be. I first tried this idea out at my Safari Baby Shower and was thrilled with the outcome. 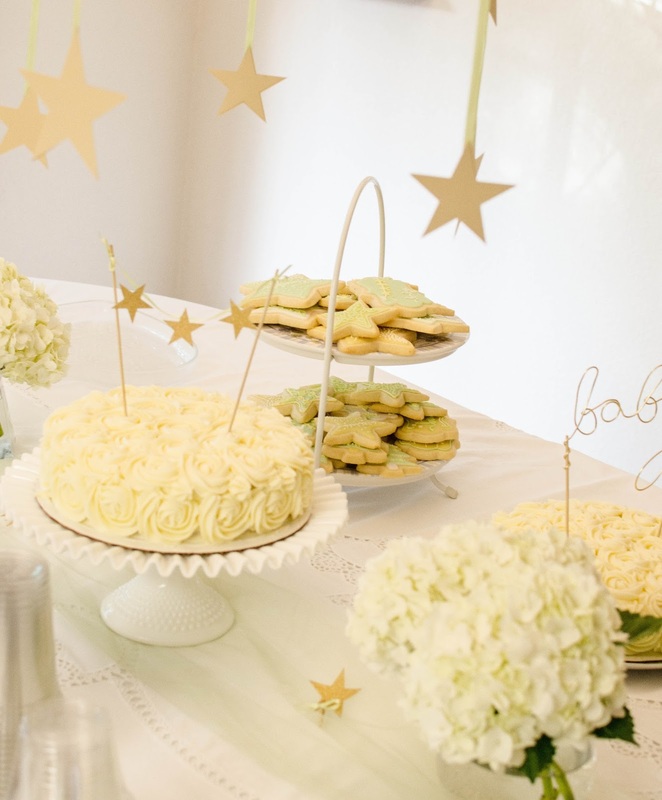 It takes coordination in advance with the guest of honor and a bit of pre-party preparation, but the end results have all been adorable. Check this post out for details on how to construct similar mobiles in a group setting. 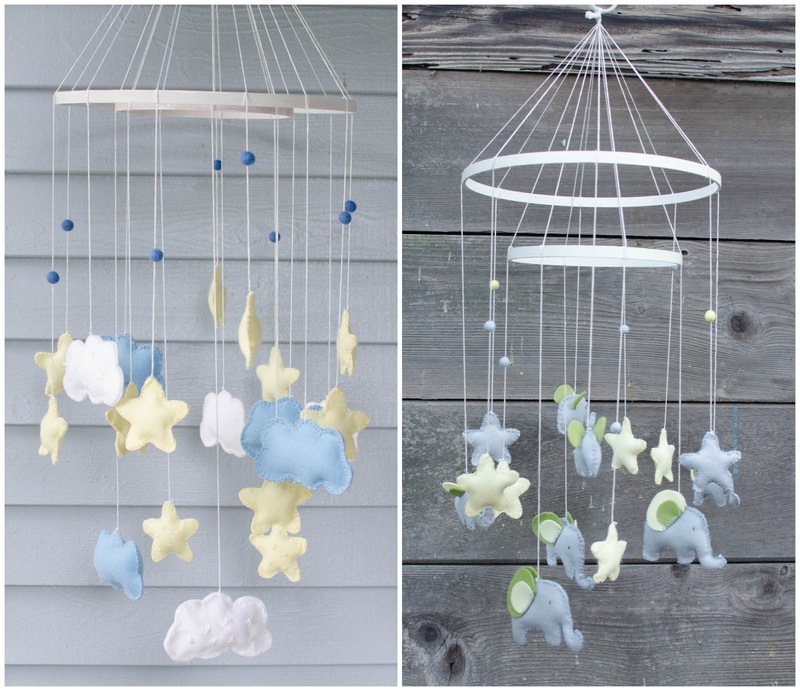 You can also download free patterns for the cloud, star, and elephant mobile pieces here for your personal use. It was a joy to watch the ladies at both showers celebrate together and express their love in anticipation of the new arrivals. Both mommas have since welcomed sweet little baby girls into the world, one of whom is my very precious niece! Hope you, Kevin and your little one aråe all ok and life is treating you well. Thanks, Franzi! I have thought the same thing that we had that undiscovered similarity. That was such an amazing trip. Maybe someday we'll bring our little guy to do some backpacking. Thanks Franzi! I am not familiar with the Liebster Award so I'll take a look:). Hello Ann! So glad you like the party. This was a really fun theme. For the mobiles I hang them from the ceiling (generally not directly over the crib because I live in eathquake territory). We have used an eyelet in the ceiling and tied the string through the eyelet and it has worked well :). Hope that helps. Have fun making yours! I love to see pics. You can tag me on Facebook or Instagram with your mobile photos! Any chance you would share your cinnamon sugar pecan recipe?